Florida Gators basketball (19-14) put up a valiant effort in the 2016 SEC Tournament, but ultimately its disastrous end to the 2015-16 regular season will likely keep it out of the 2016 NCAA Tournament for the second straight season. The one-seed Texas A&M Aggies (25-7) took 38 minutes to finally pull away from the eight-seed Gators on Friday with Florida falling 72-66 in the third round of the SEC Tournament. OnlyGators.com breaks down Friday’s loss with eight quick-hitters. It was over when: Texas A&M was forced to make some free throws to close it out, but it was a dagger three from guard Danuel House with 57.1 seconds remaining that pushed the designated home team up 68-62 and made a comeback for Florida unlikely. The Gators and Aggies were knotted at 61 with 2:23 to play after UF’s defense held TAMU without a field goal for nearly six minutes, but Florida got outscored 11-6 down the stretch and only hit one of its final five attempts. Consecutive open layups – UF was unable to scoop up a loose ball and then gave up possession on its end of the court – gave Texas A&M a cushion that it was able to hold on to for the duration of the game. Battle was lost down low: The Gators played solid defense for most of the second half but could not fix their biggest problem of the first 20 minutes: allowing the Aggies to pour it on close to the hoop. Texas A&M scored 26 points in the paint in the first half, just 0.5 fewer than Florida’s full-game season average. TAMU tacked on 18 more in the second half, posting 44 of its 72 points down low. That number set a record for most points in the paint allowed in a game over the last five years for UF, per the SEC Network broadcast. First half focus: The first 20 minutes were tight with five lead changes and each team holding a lead for seven-plus minutes. Ultimately though, Florida’s inability to keep Texas A&M out of the paint – the Gators allowed 26 points down low when they average 26.5 per game – allowed the Aggies to hold a 34-32 lead at the break. Take a bow: Junior point guard Kasey Hll has yet to truly turn the corner for Florida, but he did lead his team in the SEC Tournament with 34 points on 12-of-21 shooting with seven assists. In Friday’s pivotal game, Hill went 6-of-11 from the field and made 6-of-9 free throws for a game-high 18 points. 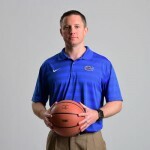 At one point, he scored nine of UF’s points during a stretch (seven straight) and put his team right back in the game. Ultimately, it was not enough, and Hill going 5-for-6 from the line down the stretch could not save the Gators from the loss. Playing through the pain: Redshirt sophomore center John Egbunu was once again effective for Florida despite the torn ligament in his dominant right thumb. He posted 11 points on 4-of-5 shooting and hit 3-of-4 free throws. Over the last two games, despite playing both injured, he’s scored 19 points while going 7-for-8 from the field and 5-for-7 from the charity stripe with 15 rebounds. Unfortunately for Egbunu, he fouled out Friday with 2:51 to play. Stars still lacking: Florida really needed top-notch efforts from its two best players in the SEC Tournament, and it simply did not get them. Combined, redshirt senior forward Dorian Finney-Smith and freshman guard KeVaughn Allen were 13-for-42 from the field, scoring 45 points. Finney-Smith did not make a basket in the second half until 14 minutes had passed, and he missed both of his free throws on the afternoon; he did, however, grab nine boards in each game. What it means / up next: Florida likely needed to beat Texas A&M on Friday, earning a victory over a quality opponent, in order to have an outside chance at an NCAA Tournament bid. Barring a surprise, the Gators will head into the NIT for the first time since 2009. Due to construction to the Stephen C. O’Connell Center, Florida will be unable to host games and will instead play away contests in the tournament for as long as it’s alive in the bracket. The NIT field will be announced Sunday following the NCAA Tournament reveal.